I've been using the iPhone SDK since its original release way back in March. Many frustrating moment in the beginning but the recent beta 7 and beta 8 release proved to be ready for prime time. Apple has added many helper classes or helper methods to classes to make it far easier to work with the UI components, which is by far the most frustrating things I encountered. I am still having problem wrapping my head around the idea of Interface Builder but since the apps that I am building do not involve very complex UI, I just hand coded all the UI instead. 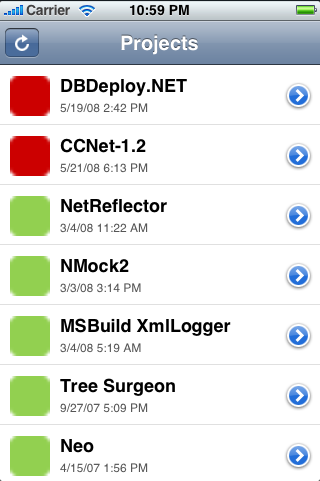 To illustrate, the original iPhone app idea I had that I started developing using the original SDK is a mobile application for Mingle. The application would consist of a series of table views showing projects, cards, and card details, along with some network code to talk to the Mingle server through REST API. At that time, progress was slow because of many factors. First, learning Cocoa/Cocoa Touch API and Xcode at the same time was tough. Second, the Cocoa Touch API was a bit 'primitive' in the beginning. What I mean is that while the API provides all the necessary hooks for developers to create an iPhone app it does not provide many pre-build components, making it difficult and required lots more work from developers to re-create the look and feel of the built-in iPhone apps. I was so put off by the initial experience that I skipped beta 4-6 and did not open up Xcode until last weekend. And what a refreshing change with beta 7! Now it is straightforward to make an app that looks and feels just like an Apple's one. I was so fired up that last Sunday evening I decided that I would try to create an app for an idea that one of my fellow ThoughtWorker suggested to me. Instead of days of tearing my hair out and got no where, I was able to create a almost features completed app within hours, using beta 8. So what is this app? It checks the build status on the CruiseControl server. 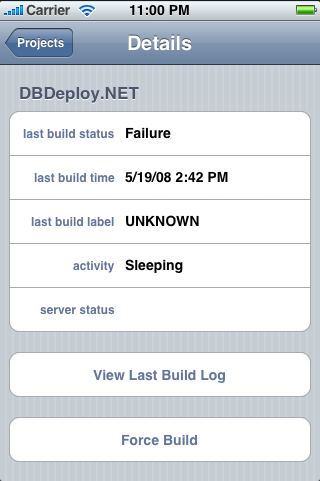 Just like CCTray (Windows) or CCMenu (OS X), it allows users to monitor their software build status. Following the convention, I am calling it CCPhone. The app isn't more complex than the Mingle app but the fact that I was able to almost match the productivity I normally get on my Windows development environment means that I was excited about working on the app rather than dreading it. Dream It… Done. Mingle Proj-o-matic, a revolutionary new feature in Mingle, completely automates the software development process. Highly intuitive and powerfully predictive, this feature does away with the need to hire a large team of developers, testers and analysts for creating software. Simply create the story cards and watch as Mingle handles the rest! How Proj-o-matic works. As for London itself, I was pleasantly surprised by all the good/new stuff they have. But at the same time, the Tube still pisses me off, with the never ending tunnels and the asinine system of having to swipe your ticket/card on exit. At least the travel cost is paid for by my company! I'm going up to Shropshire this weekend to visit my parents. Instead of taking a 2+ hours train ride, I'll be driving a rental car up. I know, it's not environmentally friendly but consider the total amount of driving I haven't done in the last 7 years, I think I can take this carbon emission hit.